three star hotel with good access! 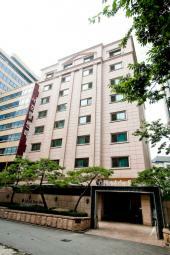 Hotel Sunbee, opened in November 2003, is a three-star accommodation in Jongno. There are 42 guestrooms total (all double rooms) with a selection of Korean, Western, and Classic style rooms with varying interior. They are completely equipped with comfortable facilities including whirlpool bathtub, large screen TV, VCR and computer. Independent toilet and bathtub featured bathrooms are also available in many rooms. There is an artistic ambience at the hotel, with paintings and plant decorations displayed on each floor, lobby and elevator. The accommodation has been designed much like an artwork itself. Jonggak station (subway line 1) is only 10 minutes away and Anguk station (subway line 3) is within 600m distance. Guests can take subway line 1 to reach Deoksu Palace, the City Hall, Seoul Station and Yongasan electronic center. Subway line 3 also take guests to Gyeongbok Palace, Dongnimmun, Seodaemun Dongnim Park and Apgujeong in Gangnam area. Many restaurants, bars and shopping centers in the area also add delight. Room interior varies according to Korean, Western and Classic rooms.